Here is my official statement in response to the MVD’s statement regarding my license. 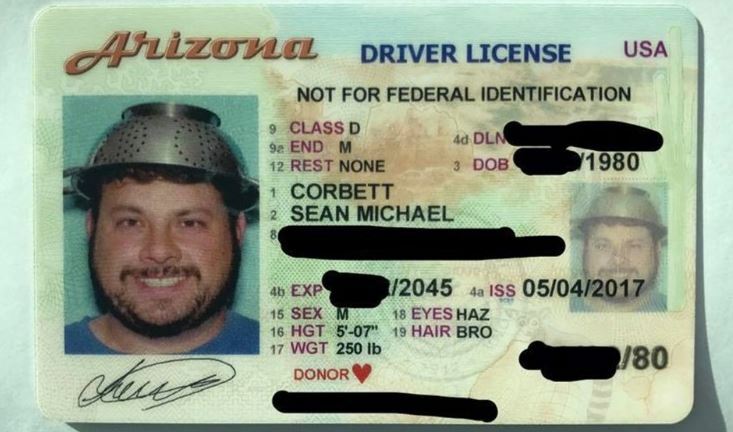 I Sean Corbett declare that I am a true and dedicated believer of the Flying Spaghetti Monster. Do not misinterpret my light hearted and jolly personality that I do not take this issue seriously because the opposite is true. It is important to understand that religion is a protected class under the civil rights act, and that no one has the right or authority to pick and choose which religions are approved or not approved. While this religion was originally created as satire to prove a similar point in 2005, it has become a global phenomenon reaching millions of people. After communicating with the OIG regarding my license, it is currently not revoked or suspended. They have a stop on the license which prevents me from making duplicates, but the license is still valid at this moment. They are requesting that I return to the MVD to surrender the license and be photographed without the headwear. I confirmed that my photo does not interfere with facial recognition software. This indicates that there is no error, they simply are discriminating against my religion. I have reached out to the AZDOT Civil Rights department and have spoken with a representative who is familiar with my story and is working with me to see what steps are necessary to fight this issue. RAmen, brother Sean! You tell them pastafarianophobic bastards how it is. way to go!!! keep up the fight!! Yes: all you have to do is give it a three week trial and see how you go. We have won another battle. When all the other religions have gone extinct we will reign supreme! FSM RAmen! Bless you, Mr. Corbett. You’re a hero. They crucified Jebus for standing against authoritarianism. Compared with that, it ain’t gonna be nearly as bad for you. Contact the media. Get a few TV interviews. If Muslims and Sikhs can wear headgear, so can you. It’s a matter of American liberty. Also, keep a colander in your car. Wear it every time you drive. That will determine a colander is indeed a part of your daily apparel. Maybe fit a colander with a chin strap. Google the number of motorists and passengers killed in the USA every year by virtue of head trauma. Demonstrate that a colander is effective as a safety helmet. To make the colander more comfortable and to prevent it from sliding, wear it in conjunction with a hat. A gold tooth would look great as well, Sean. It’s more of a disorganisation, Nichole, which is its strength. Or, are you a spam-bot?